There are numerous tests to gauge the health of your heart. But no such widely accepted test exists for the many parts of the immune system. How can we tell if the immune system is strong or weak? Or quantify how badly it’s malfunctioning when we suffer from asthma, allergies, or arthritis? A team led by scientists at Stanford University has taken the first steps toward creating such a test—by taking “snapshots” of the immune system. Before we talk about what they did, let me review how the immune system protects us against disease. The innate immune system is like a standing army that defends us against invading microbes. But the innate system has no memory. It doesn’t recognize the invaders more quickly if they return. This is the job of the adaptive immune system—B and T cells. These cells not only remember invaders; they’re able to adapt their weapons—antibodies and T-cell receptors—to make them more effective. Think of them as the Special Forces. When a vaccine enters the body, it introduces a specific but benign preview of the potential invader—say, flu virus—to allow our Special Forces to begin honing their weapons in advance of any attack. If the full-fledged invader later arrives, your body deploys those pre-made antibodies and, most times, defeats it before it makes you sick. But as we age, we’re increasingly at risk for flu. Why? A census of our antibodies might offer clues. And this is where the Stanford-led team comes in . 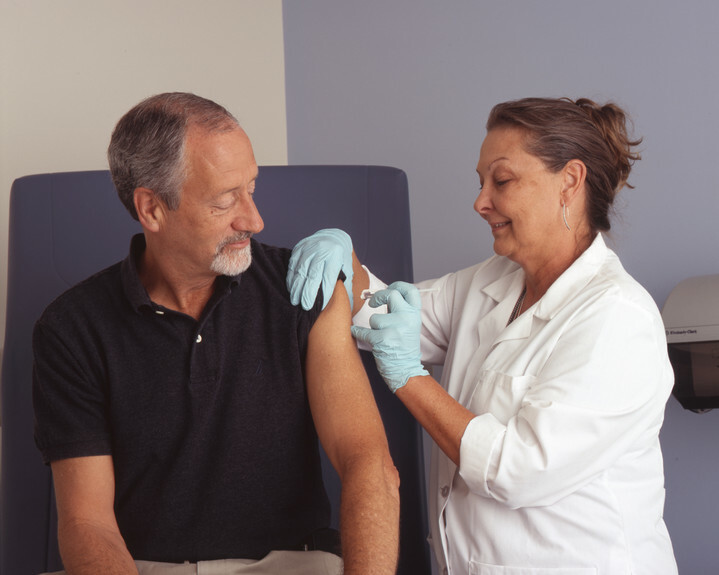 With support from NIH, these researchers recruited 17 volunteers, aged eight to 100 years, gave each a seasonal influenza vaccine and took blood samples—once before the vaccine, and twice after. Using high throughput sequencing technology, the team characterized every single antibody, from each volunteer, at each of the three time points—that’s 5 million antibodies! They noted the types of antibodies present (there are five possible types) and the specific number of each type. They then compared individual antibodies of the same type with each other. Such information allows you to figure out whether two antibodies share the same lineage—like a family tree. When the researchers crunched the numbers, they found that the 70–100 year old volunteers had a significantly less diverse collection of antibodies than the younger volunteers. That is, as people aged, their immune system had a more limited repertoire of antibodies to offer. Does this circumstance affect how the elderly react to the flu vaccine? Does it hinder their ability to fight infection? It’s certainly possible. Perhaps this smaller, or less diverse, collection of antibodies could explain why the vaccine is somewhat less effective in elderly individuals. We’ll need more research to figure it out. Having snapshots of our immune system will help us find answers. This kind of antibody snapshot, only made possible in the last couple of years because of advances in genomics, could also be used to diagnose immune disorders—especially if diseases have an antibody “fingerprint.” It might also provide a robust tool for measuring whether individuals were benefiting from specific treatments, and even provide a personal risk assessment for flu and other conditions: another element of personalized medicine. But while all this exciting research is going on, it’s still wise for you to get an annual flu shot! Where can you get a flu shot? Does this reflect the state of both innate and adaptive immunity? Thanks for your excellent question, Sahab. These findings primarily reflect the state of adaptive immunity. This was a very interesting article. I wonder if we will be able to “download” these snapshots and then track them over time. One of our patients during an air ambulance and medical flights trip could have used this recently. What about the effects of ionizing radiation from radionuclide contamination on such a model? I ask because my family lived for many years in NE Oregon, downwind from Hanford Nuclear Reservation. As a result, I’m missing almost half my IgG, most of my IgA, and what immune system I have attacks itself, with Hashimotos, Sjogrens, asthma, allergies, weight gain, etc. IgE was above the reference ranges. Peculiarly, I can see wavelengths down to UVC apparently, the eye interpreting the light as pink, magenta, blue, or violet, but whether this is the result of genetic mutation or just inherited is unknown. When a number is grabbed from the air on what percent of an immune system I have, it’s usually a quick and dirty 60% immune system, but it’s pretty arbitrary. It would be handy to have a standardized number. P.S. the Hanford 1960s studies begun during the second Bush Administration were never released that I could find. While it’s water under the bridge, it would be interesting to know what we got exposed to. Excellent. I love to read and share this post.